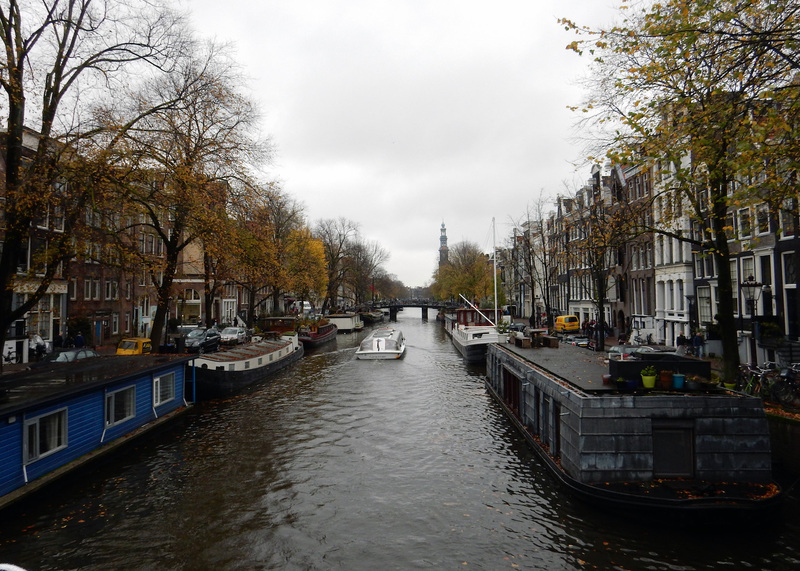 I’ve been to Amsterdam 3 times in the last year. Why? Because I bloody love the place. It’s only a 50-minute flight away and you can usually get cheap flights. In fact, it’s quicker to go to Amsterdam than it is to go home to my parents. To me, it’s the perfect city to simply roam in. Ed and I went together for the first time in April and had lovely weather; the tulips were out and we sunbathed in Vondelpark. 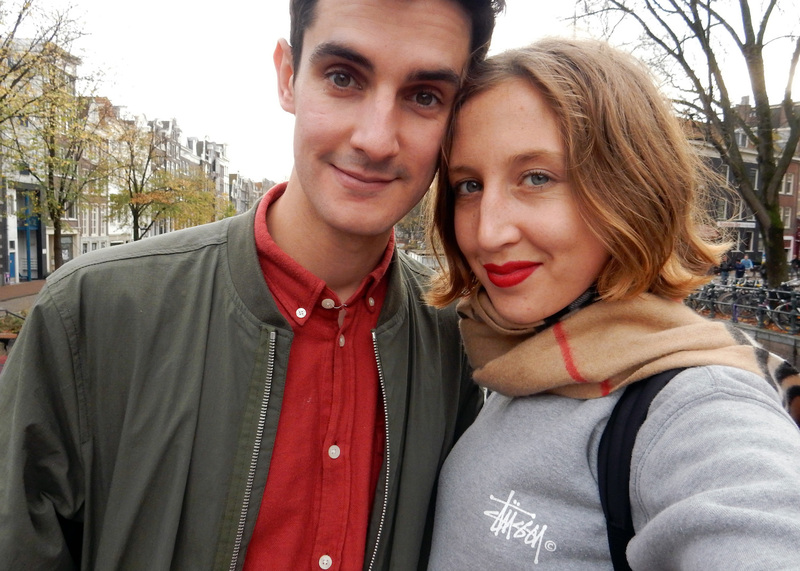 We went again in November when it was colder and slightly drizzly, but had just as good a time, exploring different areas, shopping and keeping dry and warm in food halls. We arrived late Friday night and left Sunday evening, which was fine, but I’d say 3 full days was the perfect amount of time to spend in the city, mainly so that you can try out more of the great restaurants and bars. Amsterdam has definitely come to its own; forget clogs, it’s all about cool cocktail bars, a great foodie scene and slick hotels now. We landed at 11pm and got a cab from the airport to our hotel, simply because we couldn’t figure out how to work the damn ticket machines for the train. We dropped our bags at The Hoxton, and headed to Cannibale Royale for a midnight dinner — one of the few places that serves good food at this time in the city (worth noting down if you’re flying in late). Ed went all out and got a burger and fries, and I just got fries (great though it is, as the name suggests, it isn’t the most veggie-friendly of places!). It’s got a cool vibe, I’d definitely recommend it to meat lovers or even just a drink. 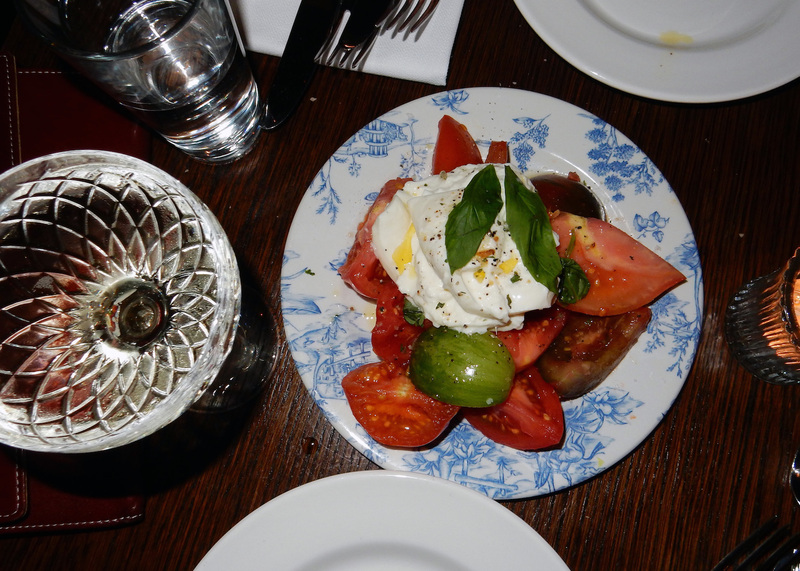 On the Saturday night, we had dinner at Lotti’s, the restaurant in the hotel, which is much like Hubbard & Bell if you’ve been to The Hoxton, Holborn, only feels a little fancier. Well it did for us because we had date night complete with a bottle of Prosecco served in pretty cut-glass saucers. Dinner was great, we shared an amazing burrata and heritage tomato salad, then Ed had the cod and mash, and I had halloumi and grilled vegetables — yum! We ordered Espresso Martinis and had them on the sofas, before going out to try our luck getting in to Tales and Spirits (often cited as the coolest cocktail bar in town), though had no joy, so ended up at a pub. Tales and Spirits is meant to be mega. There was a 45-minute queue so we sacked it off, but next time we’ll wait because I’m desperate to try the cocktails! I hear if you go super early for pre-dinner drinks it’s easier to get in! The next morning, we had our brekkie bags in bed, complete with proper brews, then wandered to Wolvenstraat 23, a cute coffee and brunch spot (pictured above with the nice wallpaper!) for takeout chai and regular lattes. 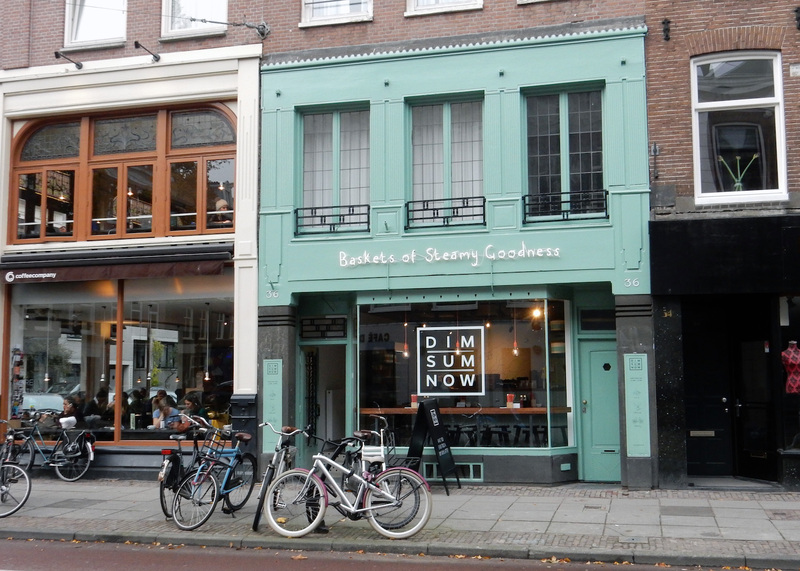 Next stop De Pijp — a neighbourhood I’d been told was worth exploring for its pretty streets, cafes and shops! 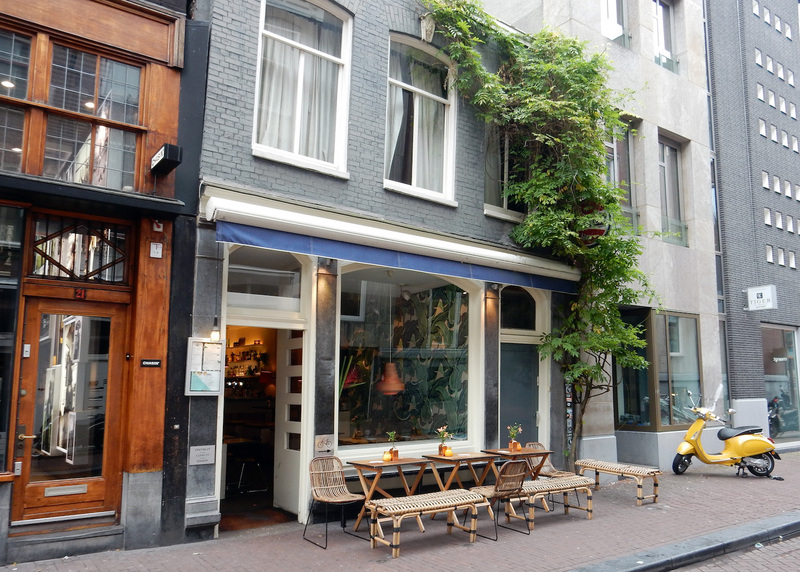 De Pijp was indeed lovely — you must go! It’s quite a walk (40 mins or so) from the centre of town but a nice one, and it’s a lovely place to potter and get some food/coffee/cocktails. 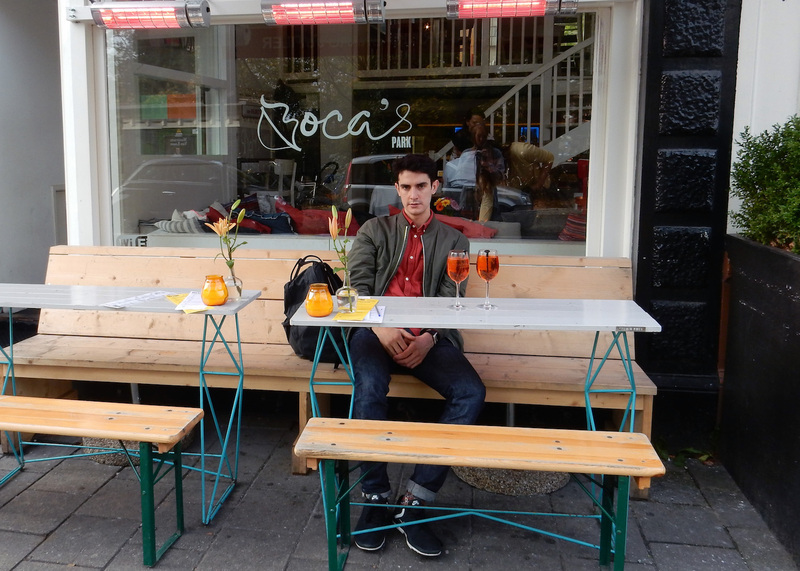 We stopped at the brilliantly named Baskets of Steamy Goodness for some har gow (shrimp dumplings) before checking out a few cool clothing stores, and then got Aperol Spritz at a cafe called Boca’s. The architecture around here is all gorgeous, and the colours, and the vibe is very yummy mummy. 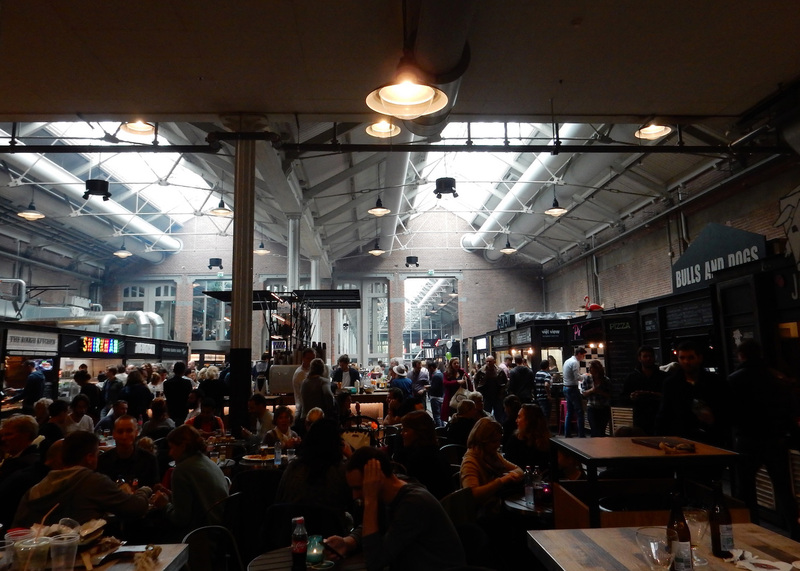 Foodhallen was a new discovery of ours on this visit and we LOVED it. So much so we went twice. It’s a giant indoor food hall with traders serving all sorts of global cuisine and bars serving artisan G&Ts and local craft beers. 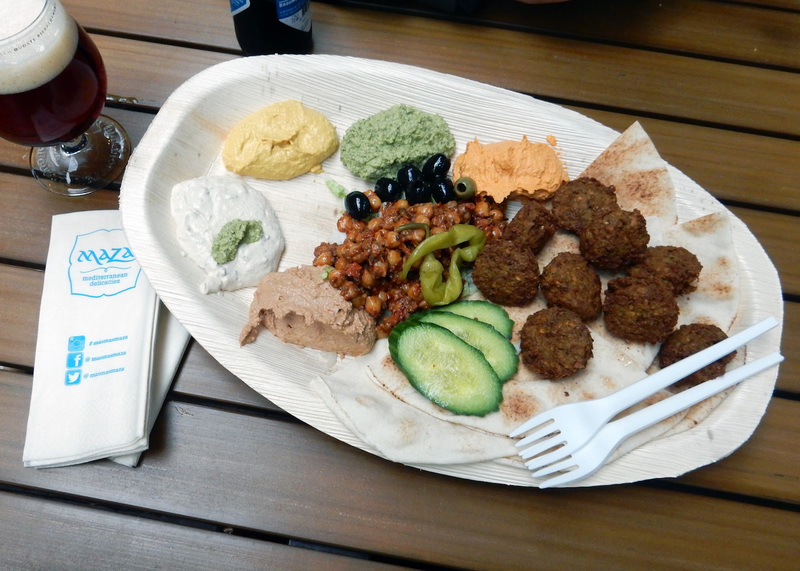 We wandered around for ages trying to decide what to get before settling on a giant mezze platter which cost €12.50 and was so, so tasty and filling! 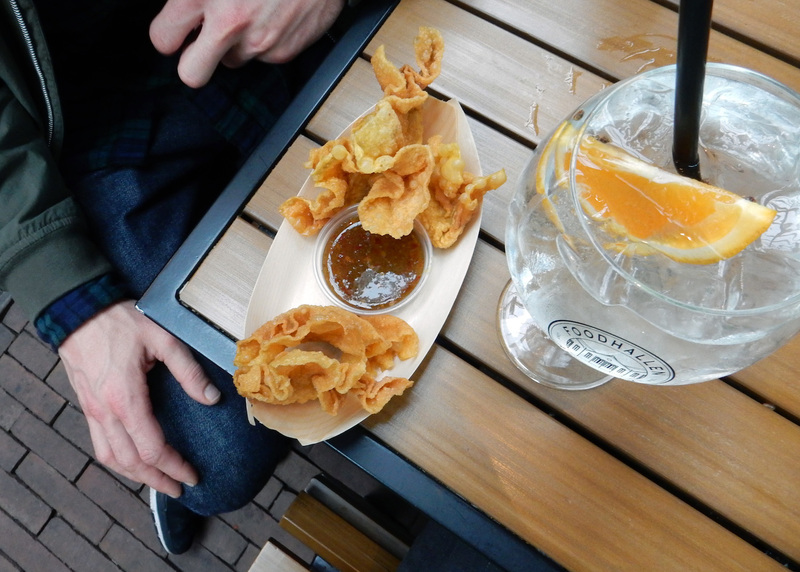 Nevertheless, Ed couldn’t resist getting more so we shared some shrimp wontons too which were heavily fried but naughtily delicious. The Gin & Tonic Bar is super pricey (be warned!) but we couldn’t resist 2 Bobby’s Gin G&Ts — our absolute favourite gin which is actually Dutch! 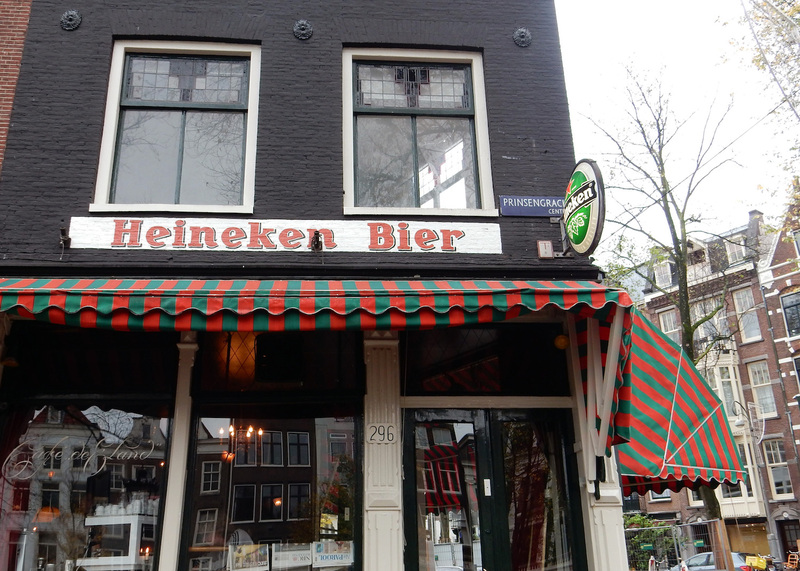 After eating our weight in mezze and dumplings, we sidled off to one of the pubs in Dam Square — not these aren’t nice places to hang out, they just have giant football screens! I wouldn’t necessarily recommend them unless, like us, your city breaks always have to feature the Premier League!! 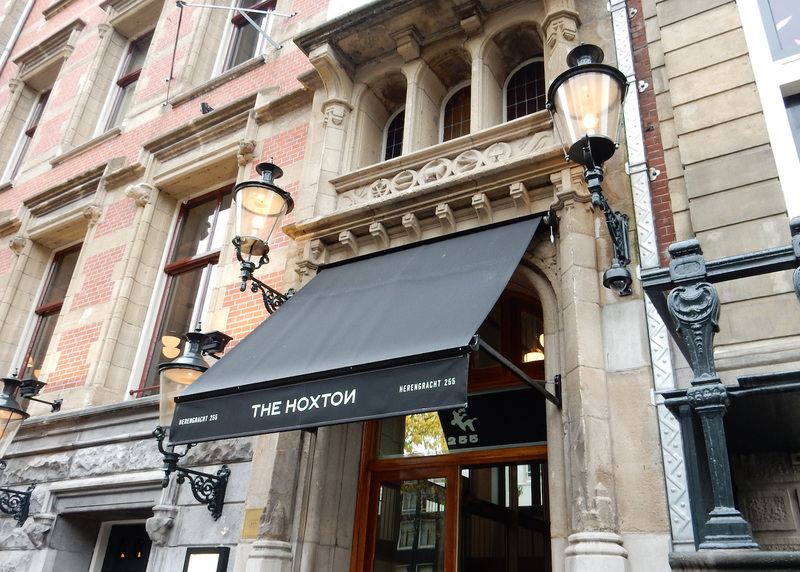 There are plenty of brilliant dinner options in Amsterdam, too many if I’m being honest! 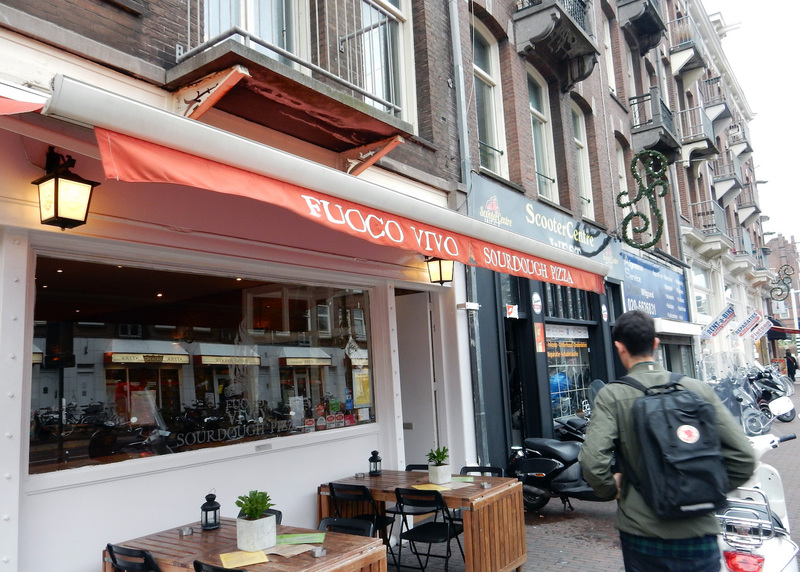 Pizza is my obsession though and last time we were in the city, we discovered Fuoco Vivo when we thought we were lost and it turned out to some of the bestttttt sourdough pizza I’ve tried. Alas it was closed this time (it does seem to have funny opening hours) so instead, we stopped for Caipirinhas at the kitschy neighbourhood Mexican joint next door — we were the only people in there but the Caipirinhas were top notch (and very strong!). 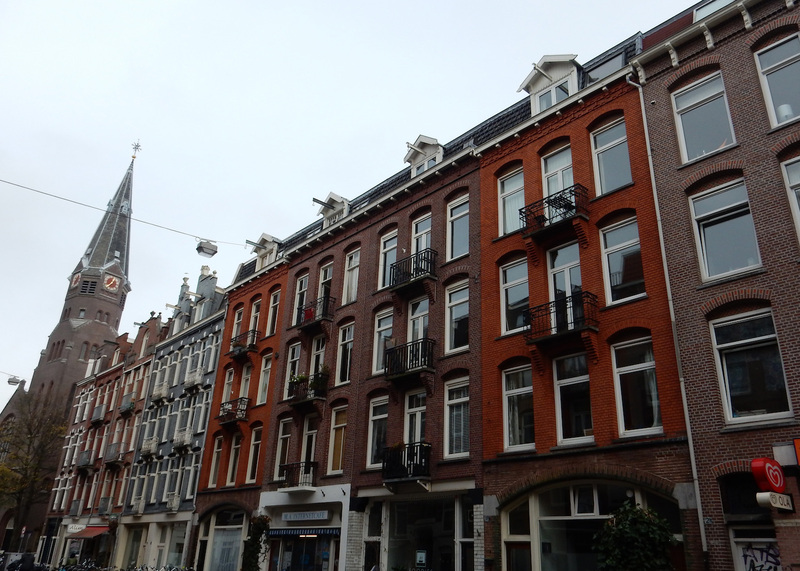 I actually love this part of the city; along with the pizza and the cocktails, Rozengracht has some great shops on it, including the Fjällräven‎ flagship (which we spent a lot of time in again!) and an awesome clothing and homewares store called Hutspot. Amsterdam is dangerous for shopping, I tell you! 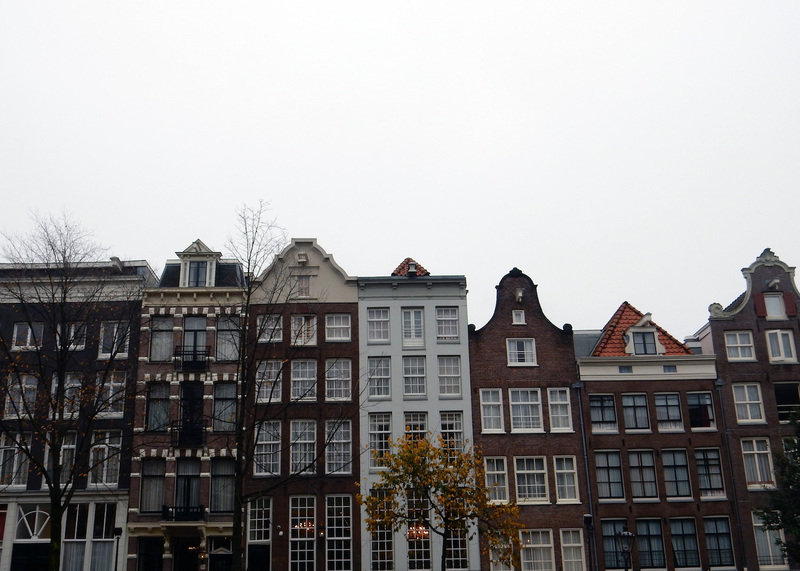 The more I think about it, the better I think Amsterdam is! We did the Van Gogh Museum last time (which is great by the way) so skipped that this time, and the queue for Anne Frank Haus was still too long to bother with (we’re talking a couple of hours queuing!?!?!). If it’s nice weather, definitely take a stroll through Vondelpark, and along the über luxe designer shopping street, Pieter Cornelisz Hooftstraat. I love the city so much I’ve already booked our next visit. We’re going in October to run the half marathon. Already excited! 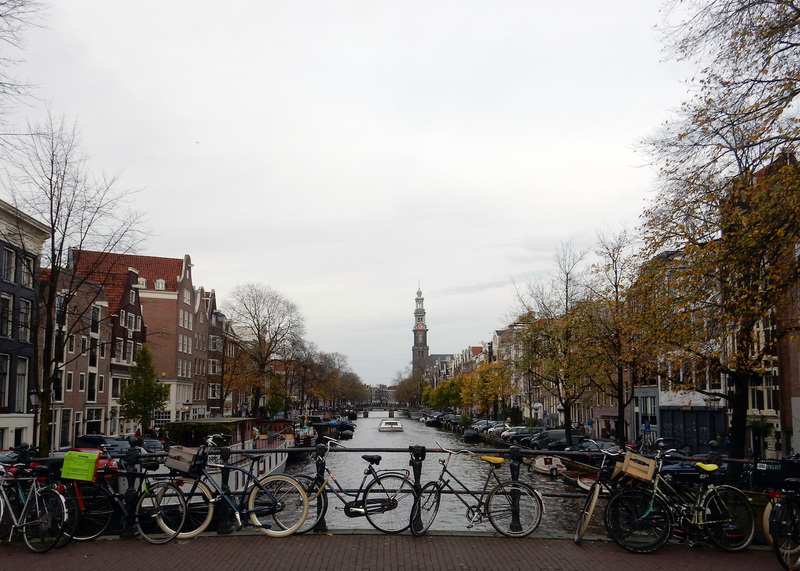 We’re going to pluck up the courage to get bikes too — we’re confident cyclists in London but it’s cycle MAYHEM in the Dam! Tweet or email me if there’s anything else you want to know!